Scarlet is one fabulous book. It’s a wonderful reimagining that has the feel as if it’s its own unique story. These are not your normal Robin Hood characters and I dare you not to adore them. Will Scarlet to the people, Scarlet to the rest of the gang, is one badass girl. She is brave, strong, loyal, and oh-so-kind (but she rarely lets that side show.) She is a troubled girl but she doesn’t let that get in the way of her job helping Robin and the people. Robin himself is very different than he has always been portrayed. He’s a bit moody and dark but still very caring. He’s hard to understand at times but totally transparent at others. He is a very strong character and easy to like. As for John Little, Much, Friar Tuck, and the Sheriff, they all have similar traits to the originals but are still amazingly unique. John Little is a sweetheart deep down and Much is impossible not to love. Scarlet has a fantastic cast of characters. Scarlet is pretty much non-stop action. The book is full of edge of your seat moments. When you aren’t dying to know who is going to win a fight you are super curious to find out about Scarlet’s past. There is just enough mystery to keep you intrigued and readers will be greatly surprised to find out Scarlet’s past. The romance is not a focal point for the book but it’s wonderful nonetheless. It flows seamlessly within the story and readers won’t be able to help falling for Robin and Scarlet. The tension between the two is thick and there were times I just wanted to shove their heads together and make them kiss. The feelings between the two were very real and believable. The thing I think most readers will have an issue with is the dialogue. It’s the way poor people spoke in that time period. It’s authentic but it is a little difficult to get used to. Once you are a little ways into the book though you won’t even notice it. It does not detract from the enjoyment of the story at all. 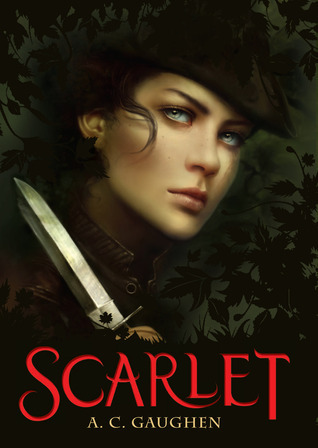 Overall, Scarlet is a must-read for fans of the original Robin Hood tale. It’s a wonderful historical book and I can’t wait to see what’s next from A.C. Gaughen. Perhaps a sequel? Looking for more reviews of Scarlet? I hope there is a sequel. I really liked this one. And I agree with the kissing thing. It was driving me nuts. I didn’t like John. It sounds pretty cool. I was pretty interested, though the romance aspect turns me off a bit. I’m too much Team Marian-Robin. This one sounds really good. I love retellings and badass girls. I can’t wait to read it! I would love for there to be a sequel. Scarlet is an amazing book and I’ve just always loved the Robin Hood story and her reimagining is wonderful. Thsis sounds really good! I’ve read an expert of Scarlet and loved it! This was a really good one, especially because all the gender relations are turned on their heads!! Scarlet was great, and I loved her backstory. How she’s nothing like what she wants people to think she is.